I commissioned the very talented Julie from Flourish & Whim to write out a word I have had on my heart for some time now. 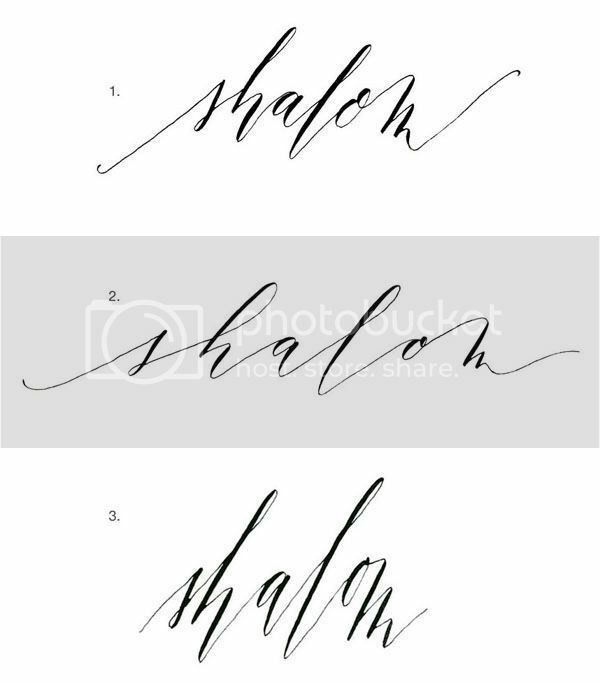 I have been going through a personal journey over the past several months and exploring this meaning of shalom. More to come on this project in the next couple months. #2, #1, #3 in that order. tattoo?? A tattoo! #2 is definitely my favorite. The spacing is perfect and I love how it flows. I love number 2 - maybe a tattoo or a welcome for your home? I like #2 because of the spacing. I'm going to guess something artistic for your home. tattoo???? I actually like #1 the most. #1. It's strong but still peaceful and calm looking. Love the font. #2 has a nice flow. But I like #1 also. Name of your new store front. I prefer #1 because it has just the right kerning. I like the spacing on #2. #2 is my favorite, and like everyone else I'm guessing a tat? Number 1 is my favorite. Then comes nr 3 and nr 2. Number three is not peaceful enough. So either 1 or 2. Pribably 1 though. Good Luck!! they're all just gorgeous (good work Julie!) and I love number two! My guess is either for the cover of a workbook full of reflections ... or a tattoo! My guess is it is either for artwork or a tattoo. My favourite is the first one but I like the second as well. My guess is either a rubber stamp design or a tattoo! I vote for style #2. I say baby + tatoo, lol. This is hard Danni they are all beautiful! my vote is for #2.. and yes a tattoo?? Is this going to be the name of your shop?? Or possible a blog name change? can't decide between #1 and #2 - they are both cool! 3rd one is also good, but not as two previous. No. 1 of course! Tatto?! I love 2! It's open and inviting. #1 is my favorite because it's easier to read than three but doesn't have too much kerning between letters. I was stumped about what this word was for, but after reading your clever reader's ideas a tattoo or the word to define your 2013 sound like the best guesses! #1 is the clearest to me. #3 is interesting but hard to read, if thats what you are going for. #2 seems a little overly dramatic to me. I think if it is signage, it's ok if its not super easy to read because the mystique can draw people in and make them feel like they found a treasure/something exclusive which is what our generation is drawn to. a wrist tattoo. I think #2 embodies the word more-it's softer. The other two look too sharp and almost angry. I like #1 for whatever you're using it for. It has the best spacing. I'm going to guess it is to go on a wall in your new home. but not sure what it could be for? ‘Shalom’ might be the name of your shop? I too thought a baby but then I thought – a new shop, a new home and a new baby?? 3 is my fav. Tattoo? #2, and I'm jumping on the bandwagon to guess tattoo or baby name! #2. I'm guessing it's to paint on the wall of your new home or maybe the new store. #1 is my fave. can't wait to see what it's for! I love the word Shalom, it has so many great meanings: Hello, Goodbye (Until next time), Peace, Inner Peace... And I'm sure that there are more that I can't think of right now. In any case, I hope this word brings to your life everything that you wish for. Definitely #2 is the best. I'm guessing a new stamp for your store, or a greeting outside your new home. I'll look forward to hearing what it actually is for. I'm Noa from Israel. I have been silently reading you blog for a few years now (2 or 3). Personally I like the 1st version better. My guess? Well it's a hebrew word with quite a few meanings: We say it as hello, goodbye and it also means peace. My guess? you're doing it to put it somewhere around the entrance of your new house (written on the entrance door? or on the door mat? depends on what it's for, but i like 1 (for a tattoo) if not then 2!! I like #2 but I really hope it's not a tattoo! Personal preference = tattoos are ugly. Maybe a signpost for your store? it's a tattoo, isn't it? i'd say #1 (or #2 depending on what it's for)!! a print, vinyl decal for a wall, or a tattoo...the spacing is better and easier to read what the word is. We have a school in Australia named Shalom.. I never knew the meaning of the word, but I now do - thanks Danni. #1 is my favorite, but #2 has something to it as well...I do like the spacing, but the one I would pick would depend on the use. #3 does seem a little hard to read/squished to me, but it does have character! I like #2 for readability and loveliness...#1 if it's for a tattoo. Style #2! For a tattoo?